This dark chocolate berry pie has a tender, buttermilk pie crust filled with dark chocolate chips, and a blend of strawberries, raspberries, blackberries, and blueberries. At the beginning of the summer, my husband Ben and I registered to be alumni hosts for a “dinner with 12 strangers” program through our alma mater. Our job was to organize a meal for 12 current students, providing them a space to meet new people and build connections. Because we love hosting dinner parties, we were really excited about the opportunity, and I spent weeks thinking about what to make. Now, I don’t do anything halfway when it comes to cooking. So when I decided to create a taco bar with gourmet toppings and then bake two pies, it involved thirteen (yes, THIRTEEN) different recipes. And in case you were wondering, this was actually my idea of “simple”. I spent all day making chicken tinga, pork al pastor, grilled pineapple salsa, cilantro lime sauce, pickled onions and cabbage, and caramelized corn. For appetizers, I served black bean dip, roasted tomato guacamole, and bacon wrapped dates drizzled with balsamic glaze (one of my favorite dishes!). Finally, for dessert: a peach crumble pie and this very dark chocolate berry pie! I was sure that by setting aside the entire day, I had given myself plenty of time and I was certain to be cool, calm, and collected when dinner came (hah!). So naturally, thirty minutes before dinner was scheduled to begin, I found myself frazzled, sweaty, and crabby instead. Standing in the middle of a messy kitchen, I was frantically explaining to Ben that the pies weren’t done baking, the dates still had to go in the oven, the guacamole wasn’t made, and oh yeah, I also hadn’t showered yet (eek!). So we kicked it into high gear: I took the fastest ever shower, concluded I would have to go sans-makeup for the night, and then Ben welcomed people with appetizers while I finished cooking. Absolutely nothing was as perfect as I had wanted it to be, but somewhere between our first and second helpings of tacos, I realized that our little group of college students couldn’t have cared less. Above all, they were just so happy to be welcomed into our apartment and to eat a home cooked meal, all while making new friends. It was such a good reminder that the point is really to gather people around the table and to enjoy good company. Good food too, but it really doesn’t need to be so complicated. I promised myself in that moment: next time, I will go simpler! I will be more present. For starters, maybe I’ll only bake one pie instead of two! And let me tell you, if I was only going to bake one, it would be this dark chocolate berry pie, hands down. Nothing against peaches at all, but this pie won out the night by far! Dark chocolate and berries are such a heavenly combination and together, they make this pie rich, and chocolatey, and jammy in all the best ways. On top of that, you’ll totally love how wonderfully tender and flaky this buttermilk pie crust is. And here’s my one rule: you should absolutely serve this pie warm!! That way, the chocolate gets all melty, and the berries are warm and juicy. Reheat in a 200 degree oven, or microwave each slice for 20-30 seconds before digging in. Combine flour, sugar, and salt in the bowl of a food processor. Pulse briefly until combined. Add butter and pulse until incorporated and the mixture is crumbly. Gradually add cold buttermilk, pulse until combined and the dough begins to come together in large clumps. Remove dough from the food processor and form dough into a large ball. Divide dough in half and flatten each half into a disc. Wrap each disc in plastic wrap and chill dough for at least 1 hour. Once dough is chilled, preheat oven to 350 degrees Fahrenheit and set out a nine inch pie plate. Combine berries, sugar, and cornstarch in a medium sized bowl. Mix gently to combine and set aside. Remove top piece of wax paper and transfer dough to the pie plate (wax paper side up). Peel off wax paper and put the pie plate into the fridge. Repeat step 1 with remaining dough, rolling it out just larger than the pie plate and removing top layer of wax paper. For a lattice crust, cut the dough into long, thin strips using a pizza cutter. Remove pie plate from fridge and place 1 cup of chocolate chips on bottom. Distribute evenly. Add remaining 1/2 cup chocolate chips to the berry filling and mix gently. Dump berry mixture on top of chocolate chips in pie plate. 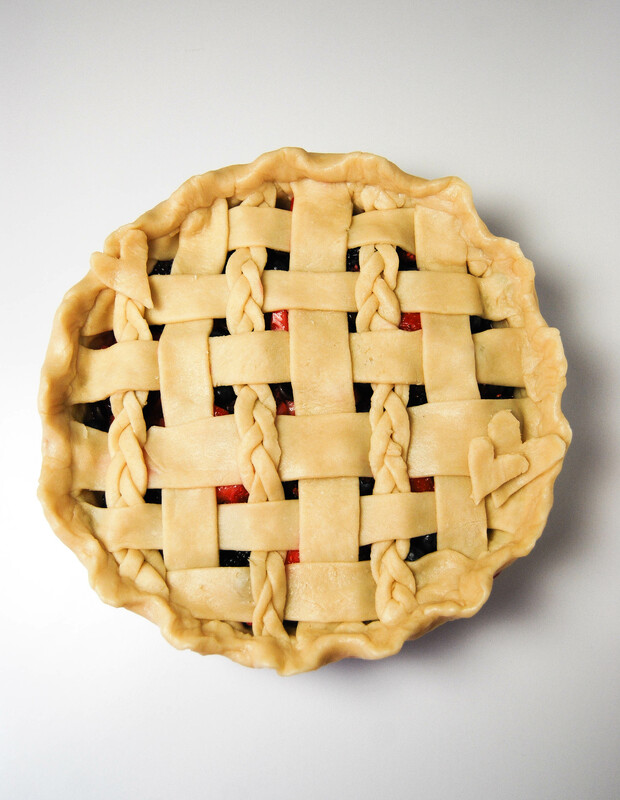 Top with remaining crust, creating a lattice, or other design as desired. Seal the edges and trim excess as necessary. Then crimp the edges. Beat the egg with a whisk. Brush the top crust with egg using a pastry brush. Bake at 350 degrees F for 50-60 minutes. Top should be golden brown, filling should be juicy and bubbling. If top is browning too quickly while baking, place foil over the top, or a pie ring around the edges. * Make your own buttermilk by measuring a scant 1/3 cup milk and adding 1 teaspoon of lemon juice or vinegar. Stir and let sit for 5 minutes before using. **I used 2 cups of quartered strawberries plus 1 1/3 cups each of blueberries, blackberries, and raspberries. What a beautiful pie!! !perfect for the baking season! love the chocolate with the berries idea! Thank you, Dee! I hope you try it out soon. Thinking about making this someday but with cherries instead of berries as I’m not a big fan of berries, do you think it would work by just swapping them out? Looks delicious! Hi Ginny, I’m excited you’re planning on making this pie! I haven’t tried it personally with cherries (yet! ), though I would like to, maybe next summer. That being said, I do think it would likely work fine. I would imagine you would need less cornstarch with cherries. Chocolate & berries are such a great combination! I have never seen them together in a pie…what a delicious idea!! I’m just seeing this recipe but it’s December, do you think frozen berries would work? Hi Audra, glad you’re as excited about this pie as I am! I think frozen berries would add a lot of liquid to the pie filling. You could try adding some extra cornstarch and/or draining some of the liquid after you mix the filling ingredients together. I’d love to hear how it turns out. Very nice recipe..looks so amazing..will try out soon..Your pie plate is so beautiful…From where did you get that? Thanks so much! I got my pie plate as a gift from Anthropologie a few years ago, I’m not sure if they still carry the same one.